Following the app revolution, chatbots are the new buzz in the technology landscape. The machine learning and AI is catching up to leverage better results. This has lead to automate chatbot conversations with consumers. Silicon Valley is always in the race to explore and create new tech trends to transform functions of different industry vertical. Today, conversational commerce is one of hottest tech trends and the restaurant industry is the foremost target. No denial, the chatbots have come up with promising future impacting work efficiency and running costs. With chatbot automation, there will be a major impact, the way restaurant owners run and operate the business. It’s also expected that technology implementation will become mandatory. Generally, AI chatbots or Talking bots are conversational agents that interact with the human in a natural way using artificial intelligence. Many giant industry leaders like Facebook, Apple, Microsoft, Google, and Slack, endeavoring to make bot conversations identical to human ones. 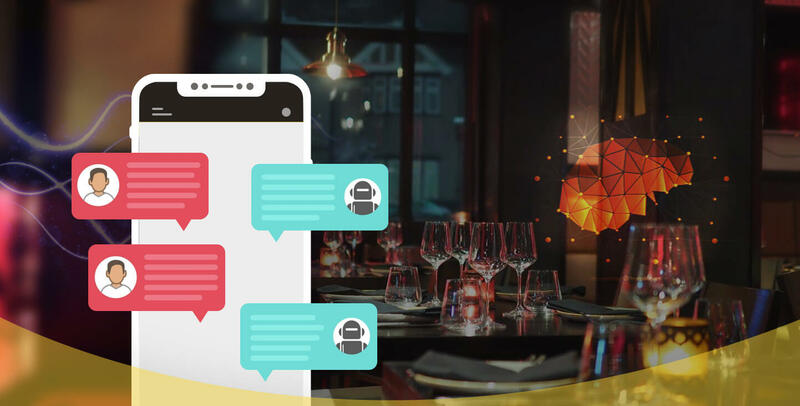 In this blog let’s throw light how conversational chatbots will change the future of Restaurants. Well, it’s a big surprise, however, Domino’s, TGI Friday and Pizza Hut have adopted chatbot in the restaurant space and that has proven successful also. Dominos and Pizzahut use it for food ordering, whereas TGI Friday finds it suitable for making reservations. Well, this is a natural question asked by online food business owner. Before implementing chatbot, all want to have a fair answer “how integrating Chatbot can be more fruitful than an app or a website. Here are some of the advantages listed that can help to understand the above-raised question, to quench the curiosity related to chatbots development services and their advantages. Unlike apps, customers do not have to download bot. For instance, if we consider a developing market like India, the large percentage of people have cheaper phones, hence the probability to download apps is less. In such scenario, chatbots come as an ideal option. With regular websites, most often people have to deal with annoying issues like slow, clunky and unresponsive. Even investing enough money to build a good website does not help you overcome such issues. And the best thing about chatbots is, it doesn’t face these problems. The chatbot provides a clear interface and is designed with the mobile user in mind so that user can easily see what is exactly happening. In website and app, there is so much happening on the screen, which confuses users where to click. However, with the bot, the customer knows exactly what to do. And the interface is very similar to one they use every day. The customer interaction with a bot and an app is relatively different. Though both are used to achieve the same thing. The app feels more like using a tool, on the other hand, the bot interaction feels natural, as bots are assisting through a process. Still, chatbots, an emerging trend in the restaurant industry, believed to be the future of customer experience. It’s impossible to replace humans completely, however, they will be used to offer real human-like and sophisticated interactions to enhance the customer experience.